Jefferson is a group of companies that serve 3 business lines - Energy Products, Flow Control & Metalllurgy. JEFFERSON SUDAMERICANA S.A., is part of the Flow Control groups. 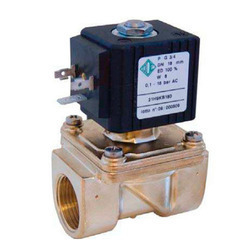 The company has been manufacturing Solenoid Valves, Magnetic Level Switches and other industrial automation equipments for over 45 years. Since its birth it has dedicated itself to serve and respond to the needs of its customers, continuoulsy incorporationg new features. Constantly perfecting its products, using state of the art machinery, it is now a redesigned organization to comply with ISO 9001 standards, with a product engineering and market-designed orientation controlled by engineers and technical specialist that check all the manufacturing stages that have made JEFFERSON, not only a pioneers in Argentina, but a leader in the control of fluids. 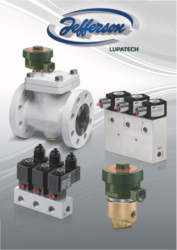 Currently its catalog of standard products includes over 3,000 models between solenoid valves and magnetic level switches which satisfy different needs and industrial requirements to control the most diverse liquids and gases such as water, air, steam, oils, refrigerants, oxygen, liquid nitrogen, corrosive fluids and many others. Its principal customers cover a wide spectre of world-wide industries like petroleum, engineering, laboratories, construction, fodd & beverage, heating, automobiles, metallurgical, textile, chemical & petrochemical etc. Its products have international recognition as attested by the approvals of UNDERWRITERS LABORATORIES(UL) in the USA, CANADIAN STANDARDS ASSOCAITION(CSA) in Canada, amongst other, which has permiteed Jefferson to introduce its product range in direct competition with other market leaders in more than 22 countries covering the five continents in such competitive markets as the USA, Canada, Mexico, Brazil, Australia, Japan, Taiwan, Greece and recently, in closed countries such as Japan, Taiwan and Singapore, with special models. Jefferson's international insertion is reflected with the establishment in Brazil through JEFFERSON SOLENOIDBRAS LTDA., in Mexico through VALJEFF S.A. de C.V., in the USA through JEFFERSON SOLENOID VALVES U.SA. INC., with seat in Miami and sales offices in New York, from which they are taken care of U.S.A. market and Canada. In additiona a network of distributors in the rest of world, fulfill the objective to cover with sales and services in all the orb. 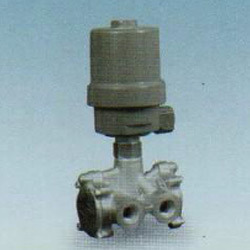 differential is below conventional valves. 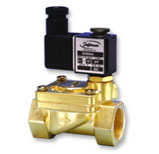 2094 series valves have been designed to handle high pressure uids such as gaseous fuels and offer the customer, the ultimate in performance, resistance and efficiency under hard working conditions. In addition, the piston system allows perfect opening and shutoff suited for high pressure systems. 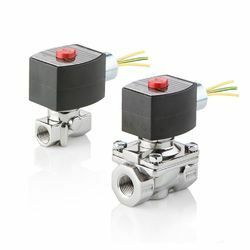 Connections: 3/8", 1/2", 3/4", 1"
3/2 way momentary energization dual coil mechanical latching valves. Connections: 3 / 8", 1 / 2", 3 / 4"
Normally closed and Normally open. Lever activated direct acting. No minimum differential pressure to operate. Body: Bronze, Stainless Steel, etc.. Stainless steel needle type seats. Class H coils coated with glass fibre and insulating impregnation. Interior use housing with an outlet for electrical connector. The straight passage prevents pressure drops and turbulence caused by the fluid’s changing direction as it is the case with conventional valves. •For the control of single acting cylinders and diaphragms. Normally closed and normally open. •Also suitable for selection or diversion of pressure. 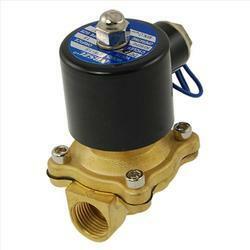 •Pumps of re-circulation for cold or hot water. 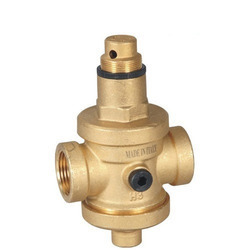 •Heating with low or high pressure steam. Coil : 6 Watts - DIN Connector. 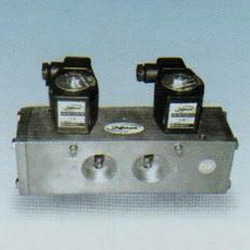 Burner pilot for gas and oil. Manual reset and automatic release.Reset with energized coil or without electric signal.The free-handle system sets the lever out of operation when the coil is de-energized (1369 version)or energized (1369B version). Double acting cylinders or diaphragms valves. Lubricated or dry air-gas, water, light oil. In addition, the piston system allows perfect opening and shutoff through an 8 mm passage, by means of a pilot orifice suited for high pressure. Size: 1 / 4" to 1/2"
The Digital Condensation Removal Timer is a compact electronic device specially designed for pipe air condensation removal when matched with a solenoid valve. 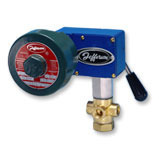 This digital timer is adaptable to any valve using a DIN type, 43650 – shape A coil, to obtain an optimal system. This device can by easy programmed by two press-keys and an LCD display. •Instrumentation, lubrication devices, robots, pilot operators. Temperature: Up to 150° C.
•Large single acting cylinders or actuators, compressors, turbines, etc..
•Ideal for instrument air or dry gas. •Single acting cylinders or diaphragms valves. 5/2 to 3/2 ways NC Convertible. Forged brass body. Buna “N” seals. 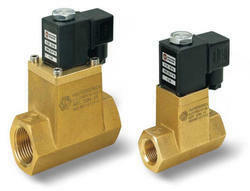 Ideally suited as pilot valves for single or double acting cylinders and actuators with NAMUR mount. 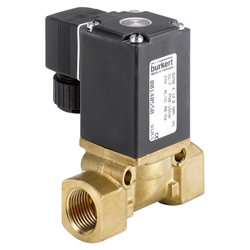 This device is designed to turn monostable 2-position solenoid valves into bistable 2-position solenoid valves. 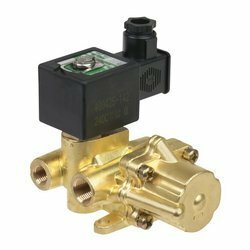 Although it uses the same coil as a standard valve, its solenoid assembly has certain specific characteristics. contact the plugnut and stays in that position (P1) by the influence of a magnet placed on top of the core-tube. To return to the initial position (P2), a new electric pulse with reversed polarity must be applied. This device can be adapted to direct acting / internal pilot valves using M or G size coils. Suitable for neutral liquids or gaseous fluids. •Single acting pneumatic or hydraulic cylinders. •Divergence of one fluid into two circuits. •Alternative convergence of two fluids into one circuit. 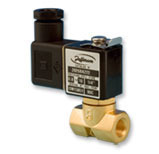 Looking for Jefferson Solenoid Valves ?